382 attendees checked in so far! 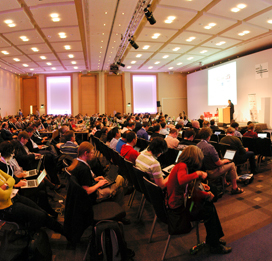 Day 2 of RIPE 63 began with a busy Plenary session, opened by Yaroslav Rosomakho, Arbor Networks, who talked about “DDoS Attack Trends Through 2009-2011”, which prompted some discussion. Kyle Creyts, Merit Network Inc, then presented “The Reputation of Networks – RIPE Region”. Martin Pels, AMS-IX followed him onto the podium with “Operational Experiences in Deploying 100 GbE”. Wolfgang Nagele, RIPE NCC, then presented “IPv4 and IPv6 assignments for RIPE NCC Routing Information Service” and Marco Hogewoning, RIPE NCC, talked about the “Resource Request for Business Operations”. There were several comments from the audience about this and it was left to the community to decide the outcome during the Closing Plenary. The second Plenary session continued the focus on technical issues, starting with a presentation on transit costs by Fredy Kuenzler, Init7. Pierre Francois of Paolo Lucente followed this with a very detailed presentation on “BGP Policy violations in the data-plane”. Antonio Marcos Moreiras from the Brazilian Network Information Center delivered an analysis of IPv6 latencies, compared to IPv4 and also over time, which identified positive news regarding IPv6 performance generally, but also some specific areas for concern. Cassio Sampaio, Sandvine Inc., continued the IPv6 theme with his study of “Measured Trends in IPv6 Adoption”, looking particularly at trends seen around and following World IPv6 Day. The RIPE NCC’s Managing Director, Axel Pawlik, shared the RIPE NCC’s plan for contacting legacy space holders in the RIPE NCC service region. The presentation prompted a lot of participation from the audience, many of whom were legacy space holders themselves. Axel encouraged legacy space holders, even those with particularly specific situations, to visit RIPE NCC staff at the RIPE NCC Info Hub for more information. RIPE Chair Rob Blokzijl supported the efforts to “blow the dust off” of legacy address space. IPv6 remains a hot topic at RIPE Meetings. George Michaelson from APNIC shared his views on the “IPv6 Deployment Beauty Pageant” and jokingly discouraged everyone from clicking on the IPv6 flash banners on the APNIC website because each click costs them money. The last item of the session was a four-person panel discussing “CPE and End-User IPv6”. The panel, chaired by Andrei Robachevsky, ISOC, included: Hans Liu, D-link; Ole Troan, Cisco; Eric van Uden, AVM; and Carl Wuyts, Technicolor/Thomson. Audience comments indicated that having hardware providers speaking about IPv6 deployment was an encouraging indication that things were moving in the right direction. There was a good mix of the technical, the practical and the policy at the Anti-Abuse Working Group session today. João Damas, ISC, gave an interesting presentation on passive DNS. Laura Cobley, Customer Services Manager at the RIPE NCC, spoke about how to report abuse to the RIPE NCC. She received many helpful suggestions on how the process should work. Michele Neylon, Blacknight, changed the theme from numbers to names, updating on how hosting companies deal with abuse. The session ended with a range of attendees discussing the interactions the Internet community has with governments and legal enforcement agencies. Shane Kerr, ISC, gave a presentation on renumbering for enterprise networks and the IETF Working Group that has been established to look at this issue, seeking operator feedback on their work. 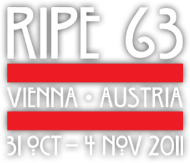 Jan Žorž, go6.si, and Sander Steffann discussed the update to RIPE Document, ripe-501, “Requirements for IPv6 in ICT Equipment”, which will conclude its Last Call phase next week. Constanze Bürger delivered an update on the German government’s roll-out of a federal IPv6 network, which led to some discussion of the role of government and the cost to taxpayers of IPv6 deployment. Timo Hilbrink, XS4ALL, provided an update on the IPv6 deployment of Dutch ISP XS4ALL. Next, several interesting Lightning Talks were held, including “Results of the 2011 Global IPv6 Deployment Monitoring Survey”, “Effects of Capacity Building on IPv6 Adoption” and “Deployment and Stateless IPv4 over IPv6 in 5 Minutes”. David Kessens reported from a draft document currently reviewed by the IETF: “IANA Reserved IPv4 prefixes for shared CGN space” and urged everyone to look at the draft and participate in the discussion. At the end of the session, Marco Hogewoning introduced “speed dating” between those who have deployed IPv6 and those busy deploying it. He said that the community, and especially the IPv6 WG, is a great pool of resources on IPv6 deployment. Attendees were encouraged to help each other.